But Mr Yeltsin, who became Russia's first democratically-elected leader after Mr Gorbachev resigned in December 1991, saw his final years in office overshadowed by increasingly erratic behaviour and plummeting popularity as the economy suffered. Bouts of ill-health were accompanied by rumours of a drinking problem, exhibited most famously when Mr Yeltsin grabbed a conductor's baton in Berlin and, apparently inebriated, tried to sing along with the orchestra. The BBC's diplomatic correspondent Bridget Kendall says despite his unpredictability, Boris Yeltsin remained a reliable Western ally, even when relations grew icy over Nato's military action against Yugoslavia in 1999. He announced his retirement in the final hours of 1999, handing over to former secret service chief Vladimir Putin, who was prime minister at the time. Mr Yeltsin may have disappointed Russians by bringing them neither peace nor prosperity, our correspondent says. But, she adds, he did help end 70 years of Soviet Communism, and that, in the long run, is what he will probably be remembered for. Mr Gorbachev paid a mixed tribute to his successor, saying Mr Yeltsin was responsible for "many great deeds for the good of the country and serious mistakes", Russia's Interfax news agency reported. Mr Putin has telephoned Mr Yeltsin's widow, Naina, to express his condolences. 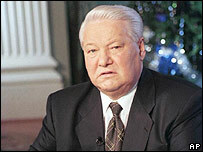 The US White House praised Mr Yeltsin as an "historic figure during a time of great change and challenge for Russia". A funeral for the former Russian president will take place at Moscow's Novodevichy cemetery on Wednesday 25 April. President Putin has also declared that a day of national mourning. "We will do everything we can to ensure that the memory of Boris Nikolayevich Yeltsin, his noble thoughts and his words ''take care of Russia' serve as a moral and political benchmark for us," he said in a televised address. Mr Yeltsin's eight years in power brought immense changes to Russia. He banned the Communist Party, introduced a new constitution which concentrated all real power in the hands of the president, and presided over Russia's troubled mass privatisation in the early 1990s. The BBC's Russian affairs analyst, Steven Eke, says under the Yeltsin leadership, Russians were given greater political and civic freedoms than they had ever enjoyed. The media, especially television, were able to criticise the authorities, even the president, in a way they would no longer consider possible, he says. But history may judge Mr Yeltsin's actions towards the rebellious region of Chechnya much more harshly, he adds. In 1994, Mr Yeltsin launched a disastrous large-scale military intervention in the breakaway republic, pledging to crush resistance in days. Speaking in an interview with Russian television in 2000, Mr Yeltsin said that he saw the lives lost in Chechnya as the biggest responsibility he had to bear. But he added that there had been no alternative and that Russia had to act against Chechen separatists. "I cannot shift the blame for Chechnya, for the sorrow of numerous mothers and fathers," he said. "I made the decision, therefore I am responsible."